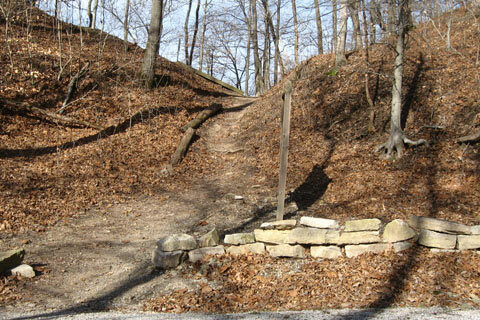 Trail Rating: short but with a moderate climb and uneven terrain. 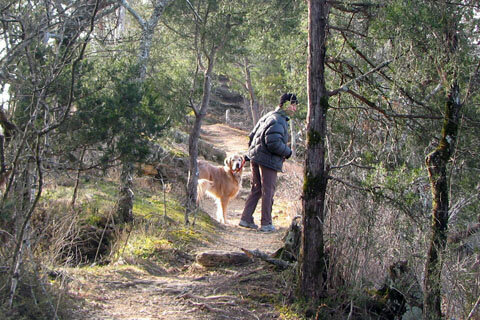 On a cold winter's day we went to hike the Narrows. 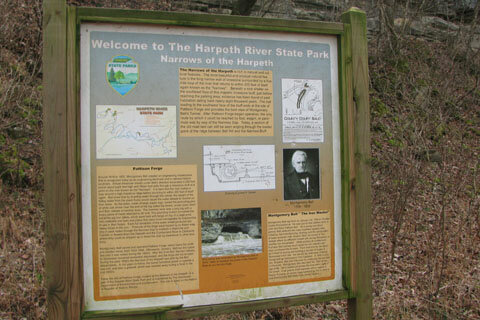 We knew that it was mainly a unique section of the Harpeth River; but we had heard it was an interesting area. We just went to check it out. Directions: From Interstate 40 take exit 192 McCrory Lane. Go north on McCrory until it dead ends into Hwy 70, Charlotte Pike. Turn left (west) on Hwy 70 and travel 5.4 miles to Cedar Hill Rd. 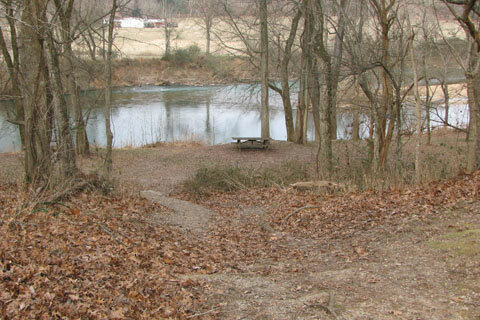 (Cedar Hill is before the bridge on hwy 70 crossing the Harpeth.) 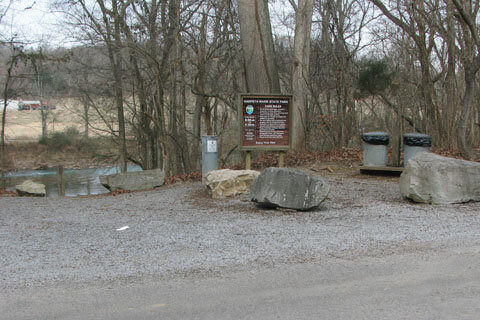 Turn right on Cedar Hill and go 3 miles to the Narrows of the Harpeth Park. Turn right off Cedar Hill just before another bridge (Harris-Street Bridge). Parking and the Trailhead are a few hundred feet away. The Trailhead is at the takeout point for those wanting to canoe the Narrows. 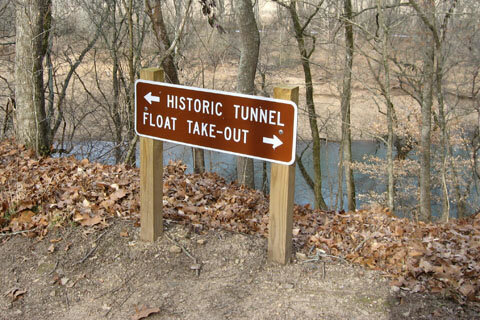 The boating routine is to drop off the canoes at the launch point (across Cedar Hill Rd on Narrows of the Harpeth Rd), drive to the takeout, and return to the boats by trail about a half mile distance. It is essentially a five mile canoe trip without a shuttle. 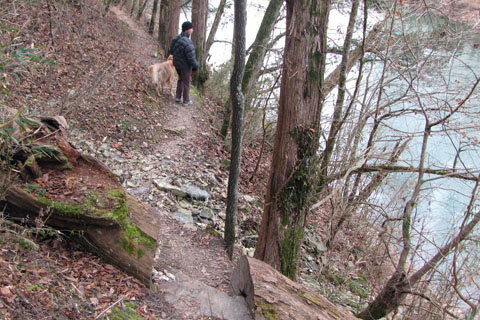 From the Trailhead, descend on the trail to a flat area above the river. 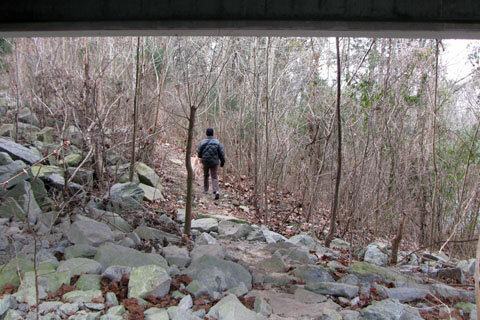 Follow the river upstream under the Harris-Street Bridge. 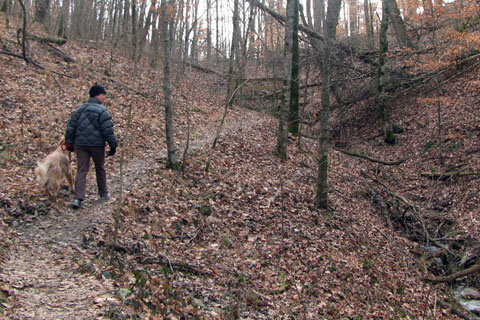 The trail crosses a steep slope. It descends as it angles across the slope. After .25 miles the trail leaves the shore and goes into a cove crossing a drainage at .30 miles. 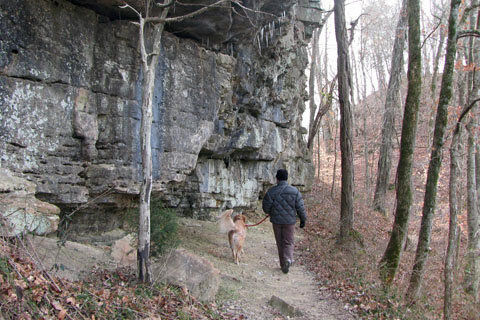 Finishing the contour, the trail returns to the river and goes under cliffs. 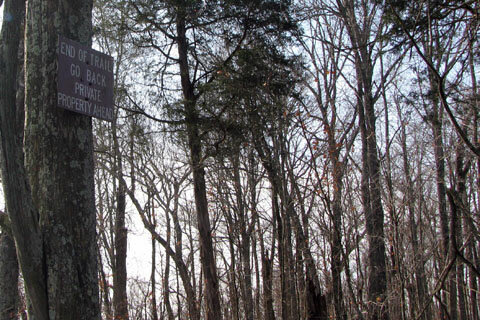 The saddle is located at .40 miles from the trailhead. From the saddle go right to reach the "Historic Tunnel". An historic information kiosk is located near the tunnel's outlet. 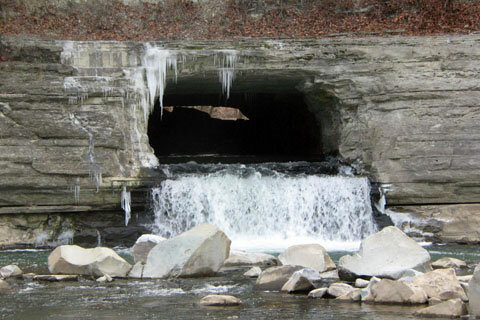 The tunnel's discharge fills a pool before re-entering the Harpeth. 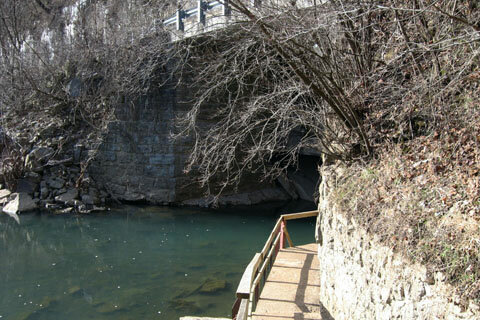 The area is unique and when standing in line with the tunnel, the view includes the upstream side of the tunnel. It is .20 miles to the pool from the saddle - .4 miles round trip. 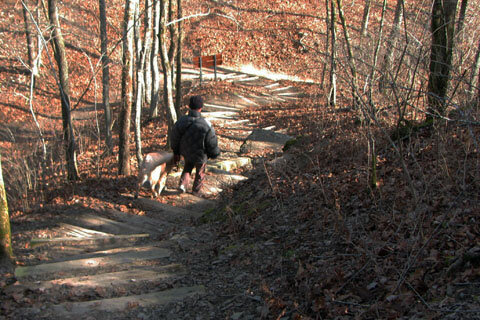 From the saddle another trail leads up stairs to the Bluff Overlook. At the top of the stairs the trail continues across the ridge, giving a few viewpoints off either side. The Bluff Overlook is a wonderful perch. 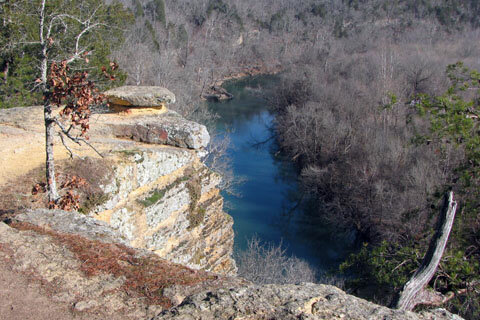 There are great views of the Harpeth. Just beyond the Bluff Overlook a sign is posted near the Park Boundary. 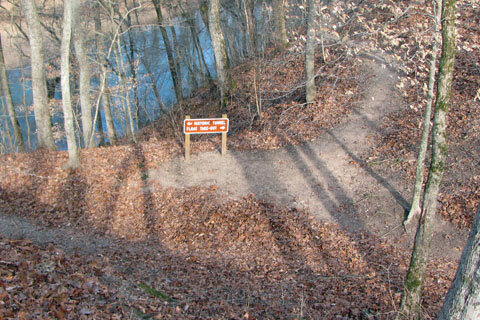 The Bluff Overlook trail to the sign is .25 miles - .5 miles round trip. 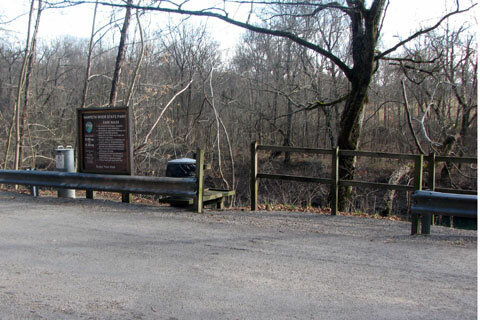 Back at the saddle it is a short distance to the Narrows of the Harpeth Rd. Go right on the road. The road is headed downstream. At .20 miles a path to the left leads down the bank and under the road to the tunnel's inlet. It was an amazing feat of engineering when it was constructed. Return to the saddle and then back to the trailhead. The total round trip was 2.1 miles. It was a short but good adventure.